Back in July 2016, AttackIQ announced that they were hosting a GameOn! Competition for their FireDrill platform. FireDrill aims to aid companies in improving their network security posture by performing continuous real-world network attack simulations, they call scenarios, on a company’s network to test whether it is susceptible to particular vulnerabilities and network mis-configurations. Scenarios can be selected, deployed, and controlled from an administration console from the AttackIQ cloud. Once a scenario is chosen, AttackIQ servers communicate and instrument a software agent that has been deployed on the host. This agent performs local/remote attacks on the company’s network, such as testing for pass the hash or outbound firewall rules, like TOR traffic. Note that these tests are harmless and only check for vulnerabilities without actually exploiting them. If a security mechanism, such as a firewall, properly blocks an attack, then the scenario will fail at the last phase it was running. Finally, it logs the results back to the cloud, which can be viewed by the user. The competition required each team’s submission to be in the form of a custom attack scenario. We took this as an opportunity to spend some time searching for vulnerabilities in common supervisory control and data acquisition (SCADA) human machine interfaces (HMIs) and create custom FireDrill scenarios for them. The deployed agent for this scenario starts by running a malicious (poisoned) project file, on a victim host. This can be thought of as a user or system administrator running an IntegraXor or Winlog Lite project file that they had received over email or some other means. The poisoned file contains SCADA simulation files and malicious scripting code. The malicious scripting code spawns a set of CMD commands and outputs a malicious base64 encoded Windows batch file. The batch file is then decoded using certutil (a default Windows program). The result is a FTP-base reverse shell that is then executed. Because these HMIs run as an administrative user, the malicious program also gets full administrative privileges. In IGX-Poison, the project code abuses a design flaw in IntegraXor’s HMI ActiveX engine that allows us to execute CMD commands on the host, which we use to decrypt an included malicious batch file and run it. We encrypt the batch file as a means to circumvent and test the network’s antivirus, intrusion detection systems (IDS), and intrusion prevention systems (IPS). Incredible enough, the process is nearly identical in WLL-Poison. However, the malicious code is written in WinLog Lite’s custom programming language and abuses its ShellExec function. This is a setup phase that checks if access controls are in place to prevent an attacker from creating files and directories for storing harvested data. If proper access controls are in place, the scenario will fail at this step. This phase attempts to create a persistent reverse shell by using the Windows built-in FTP client. We chose this route to circumvent antivirus, reduce the dependencies on post-exploitation toolkits, and rely purely on vanilla Windows services. It works by running a script that continuously downloads a text file from an attacker’s remote FTP server and execute its contents. Assuming that an attacker now has remote shell access, the harvesting stage simulates an attacker searching for sensitive data on a host. It is performed by scanning local disks for SCADA HMI projects and extracting database connections strings from the files. Sensitive information can be harvested from these project files and additional data can be gathered for future data exfiltration. The exfiltration phase attempts to send harvested data back to the attacker covertly. This phase encrypts and compresses harvested data into a ZIP file. The ZIP file is then split into 10-Byte chunks and sent over the network to the attacker over HTTP. If at any point a firewall blocks data transfer back to an attacker, this scenario phase will fail. When using IntegraXor or Winlog Lite on a production network, it’s possible to implement security measures to prevent exploitation of the vulnerability we highlight in this scenario. The most effective would be limiting the network’s internet access. Doing so would drastically decrease the capability of an attacker to communicate with a compromised host. Application whitelisting, blocking all ingress and egress traffic/ports at the firewall, employing network IDS/IPS, disabling cmd.exe and batch file execution, and email filters to block or flag project files are additional system and network security considerations. In the end, it's important that users and companies understand the risks that SCADA project files pose and how they could be leveraged to exploit and exfiltrate data from a network. Posted on May 2, 2018 by Somerset Recon. In a previous post we talked about the SecuRam Prologic B01, a Bluetooth Low Energy (BLE) electronic lock marketed towards commercial applications. After performing an initial tear-down, we were able to map out the device’s behaviors and attack surface. We then narrowed our efforts on analyzing the device’s BLE wireless communication. The Prologic B01’s main feature is that it can be unlocked by a mobile Android or iOS device over BLE. The end result was a fully-automated attack that allows us to remotely compromise any Prologic B01 lock up to 100 yards away. We have contacted SecuRam about this vulnerability, but since these devices are not capable of OTA (Over-the-Air) firmware updates, it does not look promising that they will be patched. Because of this, we advise all current/prospective customers to avoid this entry pad. The mobile application used to control the Prologic B01 remotely had no anti-reversing protection on the Android version. This allowed us to decompile and conveniently audit the mobile application’s code, which lead us to find vulnerabilities within the communication protocol. BLE data between a mobile device and the Prologic B01 lacked encryption, allowing us to sniff traffic in plaintext as it was transmitted. The Prologic B01 also does not possess a secure channel to pair with a mobile device, meaning that any mobile device with the “SecuRam Access” application installed can communicate with any ProLogic B01. The lack of encryption and proper key management allows for a fully-automated remote attack. 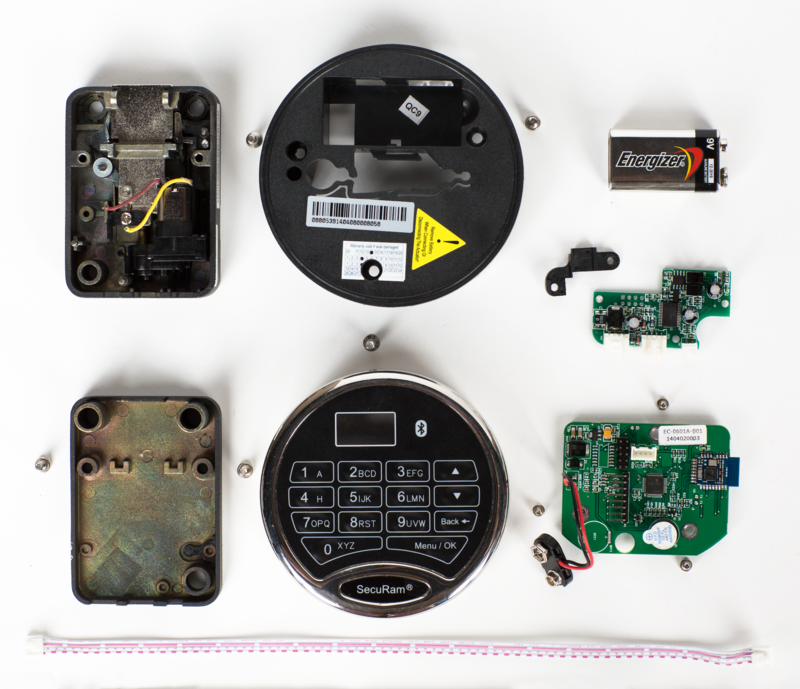 Because the Prologic B01 has a unique advertising signature, safes can easily be discovered using commodity Bluetooth devices or software defined radios. These characteristics would allow an attacker to wardrive for devices. In other words, this would allow an attacker to drive around and map out the location of safes in a region. Since BLE traffic is sent over plaintext, command packets can be decoded. The packet, shown in Figure 2, was a captured unlock command. The last four bytes of the receiver’s (pink) and sender’s (cyan) MAC address is included. The PIN (green) is parsed as a Long type and is sent in reverse order, which is illustrated above. Finally, the open time (blue) is included and specifies how long the lock should stay open, in seconds. Automating this process is what makes this attack powerful. An attacker can drop BLE scanning devices in nearby areas where Prologic B01 safes were detected. The devices can continuously scan for unknowing victims to connect to their safe with their mobile devices. The BLE traffic is immediately captured, decoded, and the unlock PIN is sent back to the attacker who is located in a safe location. In our attack, we used a Texas Instruments CC2540 and BLE Sniffer software to capture the BLE traffic of a specific target. The data is then funneled into a Python service that filters on the unlock command packet and extracts the PIN. The standards for wireless electronic locks are vague and few, making it difficult for consumers to tell whether they can trust a product or not. While the Prologic B01’s datasheet did not explicitly detail its wireless security features, the omission of that information is a perfect example of why consumers are confused, especially for a device assumed to be secure enough to protect a safe. The best measure for consumers is to avoid wireless electronic locks. Until there are verified security standards put in place, there are just too many unknown variables to take in account. If you’re developing a wireless electronic lock, it is worth the investment to incorporate security features. The Prologic B01’s biggest downfall was that it did not encrypt any of its wireless traffic. Strong encryption schemes exist and would prevent an attacker from sniffing traffic and deriving the plaintext data. This could be implemented utilizing pre-shared keys at the link-level or application-level. Strong encryption, cryptographic integrity, authentication, and strong key management are all effective methods that prevent attacks and they should be implemented to enhance the security of wireless electronic locks. Wireless electronic locks are entering the forefront of the physical security marketplace. The industry has recently been pushing on creating wireless electronic locks. As a new concept, there has been little to no regulation or standardization, causing the security of these devices to suffer. This has been the case for many residential-grade locks for a while now. However, our findings show that commercial-grade locks also suffer from the same vulnerabilities. Posted on December 12, 2016 by Somerset Recon. With the rise of IoT devices and the age of convenience, electronic locks are becoming more commonplace on safes, homes, businesses, and even handheld padlocks. While classic mechanical locks have gone through decades of rigorous testing, their electronic counterparts are still considered unfamiliar territory. Securam, founded in 2006, has designed locks for personal use, commercial, corporate, ATM, and bank security containers. Many of their products are Underwriters Laboratories (UL) certified at the highest level of security (UL Type-1). These locks can include features such as biometric scanning, WIFI, Bluetooth low energy, and mobile application interoperability. While adding convenience, these features do not necessarily harden the security of their product line. With this in mind, we decide to analyze several Securam devices to see how they worked and if the devices had any potential security vulnerabilities. The following teardown was performed on the Securam ProLogic 0601A-B01 entry pad and Securam EL-0701 lock body. The entry pad allows a user to enter a 6-digit pin number. When correct, the entry pad sends an electrical signal to the lock body, which is positioned on the inside of the safe. The lock body will then retract the bolt allowing the container to be opened. The entry pad also supports bluetooth communication, and the device can be controlled using an iOS or Android application. Front side of the entry pad circuit board shows power connections for a 9V battery and a 10-pin debugging interface (J1). Back side of the entry pad is where the board’s main MCU, a Renesas μPD78F0515A (U1), can be found. It’s accompanied with an NXP QN902X SoC (U6) for BLE communication. Peripherals, such as the 8-pin keypad header (P1) and 4-pin serial interface (P3; ref above) to the lock-body are also located on this side. This serial interface is both used for communication and to carry power to the lock body. There are unpopulated footprints (U2, U4, BAT1), which may have been used in previous revisions of this board, for debugging purposes, or other models of this entry pad. Front side of the lock body circuit board uses a less featureful Renesas μPD78F9234 MCU (U1). It is only known to communicate with a entry pad over the wired 4-pin serial communication interface (JP1), but there is another serial interface (JP2) adjacent to it that is hidden by the lock body cover. Additionally hidden is a 2-pin connector (P1) that is tied to pin 14 on the MCU. Its purpose is still undetermined. Back side of the lock body reveals another 8-pin debugging interface (J1; under sticker) and the hardware reset button (SW1). The reset button allows the lock body and entry pad to “relink” if the devices were to somehow fall out of sync with each other. The reset button is also used when connecting a preconfigured lock body with a new entry pad. The lock body is the only mechanical part of the system. It is composed of a DC motor and bolt. If 5 volts is applied across the red and yellow wires shown, the DC motor will retract the bolt and allow the security container to be opened. By inspecting the lock body and the keypad, we were able to gain more insight into how the device operates. This additional information gave us clues into its security and potential vulnerabilities. In part two of our blog posts we'll cover a more in depth security analysis of the devices and some vulnerabilities we discovered. Follow us on Twitter @SomersetRecon to catch our next posts in the series. Posted on June 8, 2016 by Somerset Recon. We dive into the security of Hello Barbie in the second part of our teardown! Posted on January 25, 2016 by Somerset Recon and tagged IoT Hello Barbie. We look at the security of Mattel's new Hello Barbie, an Internet-connected doll that talks to children and records their conversations! In Part 1, we teardown the doll and show what makes it tick. Posted on November 20, 2015 by Somerset Recon and tagged Hello Barbie Barbie IoT Hardware Hacking Teardown. Keep up to date on our newest work. We send out a summary no more frequently than once a month. And we'd never use your info for anything sinister. We promise. Want to say hi? Click on the button below to contact us with any questions you may have.